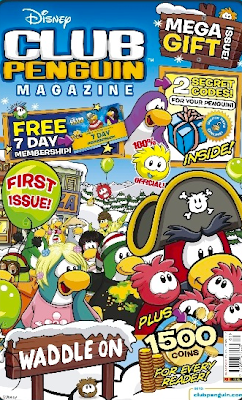 Club Penguin Cheats by Mimo777 Club Penguin Cheats by Mimo777: UK Club Penguin Magazine! oh man its not for U.S.A. :( how come they do so much in canada and austrailia? its so unfair when ur in washington. Thats so ridiculous you American people whine when you cant get your toys and so on. Think about someone like me, people like ME doesnt have any store which could sell these because in our country migth not be Target etc. I'm so excited! I live in UK, and I'm gonna buy it the day it releases! I wonder if it's coming to Australia? I wish I could send the magazine over the Atlantic Ocean. I wish they would have this in the us! I want it so bad! I wish they would have more stuff here. The only club penguin thing I have seen in stores are card jitsu cards! @Waffles that is the same with me. I used to live in Scotland but now I am living in Norway. Whooo hooo i'm in UK a while ago I emailed CP and telling them if you put a magazine in UK CP will be way more people! You people from Canada and the USA moan on and on when you can't find this individual thing. In the UK, this is one of the first things we get. We are lucky to get anything.